On the morning of the 19th of Ramadan an assassin crept up to Ali ibn Abu Talib as he was saying his prayers and struck him on the head with a sword. This event started what became known as the period of al fitna, the great chaos and civil war that tore apart the Muslim community. Yet, on a personal spiritual level, I find it interesting that the last ten nights of Ramadan, a time when fasting Muslims enter into a deep spiritual period in which during one of these nights the Quran was revealed, is preceded by the anniversary of Ali’s death. Ali ibn Abu Talib, born inside the very Kaaba itself, represents to the Shi’a the essence of what it is to be a true Muslim. I think his example is true for all Muslims, regardless of what they may call themselves. There is much that we all can learn from this noble man. Ali was the closest person to Muhammad. He embraced Islam as a youth and throughout Muhammad’s prophethood Ali stood by as a loyal and dedicated follower, some would say leader, of the Muslims. He possessed all the excellent qualities that manifested as what a true, noble human being should be. He voluntarily offered his life for Muhammad when the pagan Meccans tried to kill him. he fought in all the battles against these pagans, yet displayed such chivalry on the battlefield that earned the respect of even his enemies. Once when in the heat of battle Ali had an enemy pinned to the ground, and was ready to strike. The pagan spat at him and cursed him, Ali simply walked away. Bewildered, the pagan asked why he didn’t kill him? Ali responded that he was fighting for God and for righteousness, not for himself. Such examples of his noble character are found in a multitude of stories. 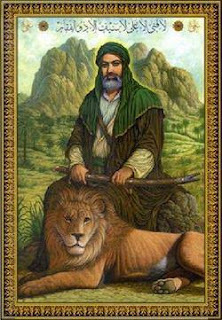 The noble Assad Allah, the Lion of God as he was known, used to visit the sick and tend to those who could not help themselves. Ali was known to be gone for a part of the day. After Ali died, a few of his companions passed by the house of a leper. The leper, who had no arms or legs, asked the group about Ali and if they had seen him. They told the leper that Ali was assassinated. The leper then began to cry, informing the companions that Ali used to visit him once a day, feed him and tend to his needs. Overcome with grief, the leper died. His commitment to the welfare of the society was extremely honest and dedicated. When his wife, Muhammad’s own daughter Fatima, asked if it were possible to get a house servant to help out in the busy household, Ali responded that he could not do this, as there were people who didn’t even have a house to live in, let alone afford a servant. He lived simply, eating barley bread and soup. The Islamic teaching that all people should share with each other was Ali’s life-motto. It is a sad chapter in history and in Islam that his assassination happened. But evil will always be there, attempting to deceive and destroy goodness. Ali knew this, too well. This great man has been lauded by historians and writers throughout history as an exemplary example of what a human being could be, and should be. Ali stood, alone if need be, against all forms of hypocrisy and falsehood. He certainly is an example for all of us. Muslims today need to reassess what it means to be a ‘Lion of God’ and stand for truth, though it be against your own family and kin. This also means to stand against those who would use their faith to subjugate people and create ignorance in God’s name. May we all learn to be true warriors of moral courage as he was, and stand on our own. A Reformation in Islam will take place if we dare to be so brave.